One of the greatest accomplishments a fantasy football dynasty owner can do is finding and connecting on a deep sleeper that will help you win your league. I will tell you that it isn’t easy. Many writers and “experts” use the word “sleeper” rather loosely. First, I am no expert. My bills get paid at my real job in the accounting department. I took two professional scouting classes, have some great knowledgeable friends (whom I still learn a lot from), and watch at least 16 football games a week (mostly professional during the NFL season, but lots of college tape during the offseason and a little high school during their school year). 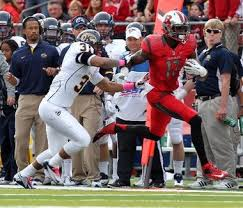 So I am going to call undrafted free agent former Rutgers wide receiver Brandon Coleman (who got signed by the Saints after the draft), my “sleeper.” The first thing you notice about the rookie receiver is his size, 6’ 6” 225 lbs. He is hard to miss when you watch him play. I reviewed three of his 2013 collegian games against Fresno State, Cincinnati, and Notre Dame to get a good feel of what skills he brings to New Orleans. Coleman reminds me a bit of a young Marques Colston, who excels in Sean Payton’s high octane offense. But let’s discuss his flaws first. The young receiver has rail-thin legs and is a long strider, which simply means he takes time to build up his speed down the field. Perhaps this won’t be an issue with the quick strike appeal of Kenny Stills and Brandin Cooks that could leave Coleman one on one on deep patterns. Coleman ran a limited route tree, specializing in deeper routes, crossing patterns, and slants. He did lose the ball a few times on some of the deeper throws at Rutgers, but then again he didn’t have Drew Brees throwing him the ball either. I would like to see him improve as a run blocker and show consistent effort on every play. He towers over his coverage on every pass with his height. His long body limits Coleman somewhat, because the receiver needs passes thrown between his mid-section and two feet above his head. The receiver has soft, big hands that he uses to bring in the ball while running in full stride. Coleman has good body control, can get to the ball at its highest point, contort his body and stick the landing with his toes before going out-of-bounds. He could be a huge red zone weapon on fade patterns because no defensive back can get higher than Coleman can in the back of the end zone. Coleman flashes some physicality and toughness too. He does a good job keeping defenders off his body with his strong upper body and employs a nice stiff-arm once the receiver has the ball in his hands. Contested catches are second nature to him, because Coleman doesn’t always do a good job of creating separation. The receiver surprises sometimes with a few double moves that temporarily create an opening. When Coleman faced press coverage, he did fine, but it might be more of an adjustment in the NFL. I really don’t expect a great deal out of Coleman in his rookie season, but I think he could perhaps slide into the Colston role in 2015 and with Brees chucking the ball, but you never know. He is going undrafted in a lot of leagues or in the last round of others. At that price, Coleman is pure upside. Support the site by donating using the PayPal button at the bottom of the page. « Ra’Shede Hageman: Highly skilled, high effort?